Sandry's book is the first book in an amazing fantasy series. 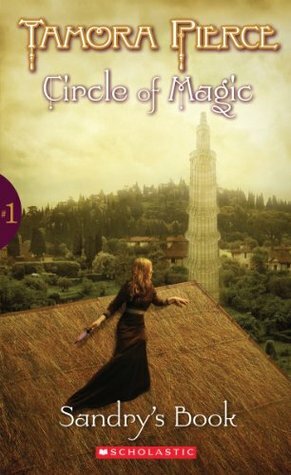 The Magic Circle tells about a group of kids, about twelve or thirteen when they first meet, who all came from particularly trying experiences. Briar, a street thief, has lived his life by the law of the Thief Lord, and is one more theft away from hard labor and death. Tris, having been shunted from aunt to uncle to cousin because she's too "odd" finally causes an uproar that can't be ignored. Alone in the dark after the death of her parents and the murder of her nurse, Sandry somehow calls light into her thread to keep her hope alive. Daja Kisubo, banished from her tribe of Traders after the sinking of her ship and the death of every other person she has known, now has to live her life among the non-traders, or kaqs, and never speak to other Traders again. Desperate and alone, the children make their way to Winding Circle Temple, with the help of their mysterious guardian Niko. The kids are brought together under the roof of the cottage, Discipline, and despite their differences, start to grow on each other. With Niko and a handful of other older mages as their mentors, they learn that, unlike most people who are born with magic and can cast spells and make objects fly, they have a different kind of magic. Ambient magic. While this magic is hidden, and cannot always be caught, it is much more powerful than Academic magic. Ambient magic comes from deep within them. Briar can feel what plants feel, make them grow, and talk to them. Daja calls to metal, can carry red-hot iron in her bare hands, and speak to the flames that temper it. Tris's powers are in the winds and the tides, calling weather and storms, and Sandry's is with weaving, calling light, sound, and anything else to the thread to give it magical properties. When disaster strikes their new home and their lives are thrown into jeopardy once more, it takes all four of the children's newly growing powers to keep them alive and to keep their new home safe. In my opinion, Tamora Pierce is a god among fantasy writers. She has the uncanny ability to introduce new ideas into a genre that really seems to only repeat itself time and again. Pierce brings home the idea of a kind of magic based in real work, such as gardening, spinning, smithing, glassblowing, etc. She shapes the mundane into a kind of real magic that you can relate to way more than things like flashy incantations and making objects fly. This isn't the Harry Potter "foolish wand-waving" kind of magic, this is an internal, deeper, stronger magic that really has power. I think it's also worth knowing that this is more of a YOUNG young adult novel. It kind of fits in the preteen and early YA section, because while there is a lot of learning and really interesting philosophy and life questions being asked, there isn't really a romance or other typical markers of YA. Allow me to tell you a bit about this book, and my reading experience. My boyfriend and I went to visit his brother and niece. She is ten. As a ten year old, the last thing she would rather do is read when she has a computer, iPad, etc to keep her company. This, of course, breaks my heart into tiny little pieces. SO in an effort to get her to read, I thought I would share one of my favorite book series from when I was her age with her. I started reading to her after dinner, and slowly, my boyfriend and his brother started to listen in. Eventually Sanaa (my niece) got bored, but Josh and his brother kept listening. Soon it wasn't Sanaa asking to read, but Josh. Even after we left, he wanted to keep reading and we kept on late into the night in order to finish the book. Now he wants to read the rest of the series and I'm kind of thrilled :) While I may have failed at teaching my niece about The Circle of Magic, at least my guy likes Sandry, Briar and the rest! Who would have thought I'd be reading to my fully-grown boyfriend before I started to read to my kids, but hey...it's good practice right!?! I give Sandry's book 5 Keys. This is one of those books that you remember really fondly from your Middle School years, and one that shaped me into the reader, and the person, that I am today. While this first book may drag a little bit as we adjust to an entirely new world and a lot of characters and cities with foreign names, the story is a really fascinating and different one. All of the characters have strengths and weaknesses, and I thought it was fun to notice that the adults have real personalities. Many adults in YA books are cardboard cut outs, just used to cause conflict and have no real place in the plot and story. Not Niko, Frostpine, Lark and Rosethorn. These characters are, in my opinion, even better than the children. You get more indirect personality and character history from them, and it really shapes them into creative and wonderful characters. I am a BIG ol' fan of Tamora Pierce, and I'm glad to say that now my boyfriend is too.